I am very pleased with this product. This is a piece of art that I put in a frame worthy of its stature. It is now hanging in my husbands office and everyone who sees it stops to admire it. My husband is in the shipping business and I will be ordering more for him to adorn his office with. Completely worth every penny, also was shipped in a quick manor. I bought the USA map for a colleague returning to her home country. 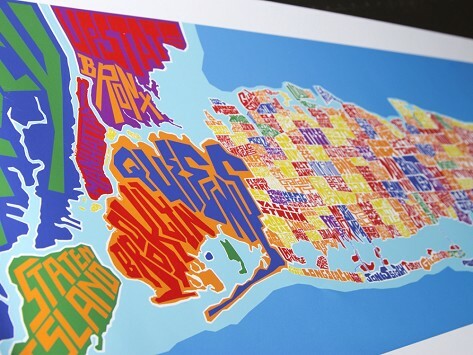 It is so beautiful in its detail, each state and capital in colorful representation. It's a real show piece for anyone who loves maps or travel. I had a very hard time parting with both the map and the box it ships in. My friend loves it! And I have put one on my Grommet wish list. My Map of Italy came pretty quickly in nice packaging. The graphics are wonderful, bright and crisp! The paper is very good quality. The Manhattan map looks fantastic on my wall framed in blue. I'm considering getting the Long Island map too! We purchased this artwork for our office on Long Island. It is definitely a focal piece in our lobby. Many great comments for this great work. Loved the SF map I bought for my daughter. Now I need Pittsburgh! And Philly when you get around to it. But Pittsburgh would be super!